Batavia, NY- When State Senator Catharine Young was just 14 years old, a fire set by an arsonist destroyed the hay-filled barn on her family’s Livingston County farm. During her commencement address Sunday at Genesee Community College, Young talked about how struggles like that shape who we are. She inspired students to work hard and realize that failure often precedes success. Young spoke before a crowd of about 700 students and their families and friends. In all, Genesee Community College expects to confer some 900 degrees and certificates to students who completed studies in January and May 2013 and August 2012. Final numbers won’t be available until early June. Senator Young is the second oldest of six children. After the fire, she got a job at a restaurant in town to help her family. By age 16, she was a supervisor and at 18 she was asked to become a manager. She turned down the job because “You see, I was determined to go to college.” She worked three jobs to earn her degree in mass communication from St. Bonaventure University. 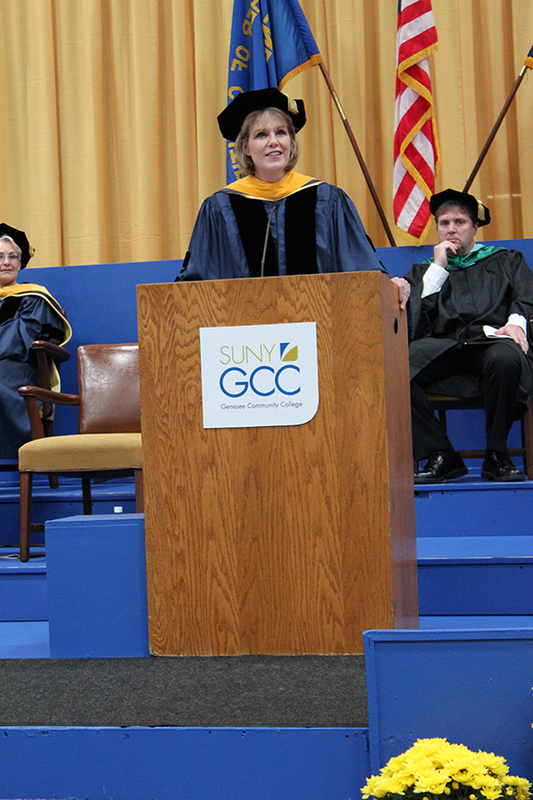 “You have adopted the right attitude by valuing higher education and understanding that what you have learned at GCC opens a world of opportunities to you,” she said. Young started out as a newspaper reporter in Rochester. To help make ends meet, she took a job cleaning offices downtown at night. “I remember one morning at about 1 a.m. crying into a toilet bowl that I was scouring. I thought ‘I went to four years of college for this?’ But those type of experiences build character,” she told the graduates. For more information, contact Rick Ensman, Jr., Director of Development and External Affairs at (585) 343-0055 ext. 6234, or via email: RGEnsman@genesee.edu.